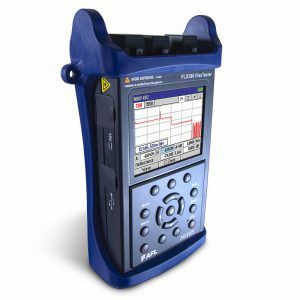 SMLP5-5… Single-Mode/Multimode Test Kit… with Wave ID and Data Storage… WE ARE AN AUTHORIZED AFL FUJIKURA / NOYES DISTRIBUTOR… The SMLP5-5 test kit combines the OPM5-2D optical power meter and OLS4 integrated LED and LASER light source and is ideally suited for testing fiber optic networks. The OPM5-2D offers Wave ID, automatic wavelength identification and switching, when used with the OLS4 light source. Multiple test Tone detection is provided for fiber identification. The OPM5-2D stores optical references for each calibrated wavelength. 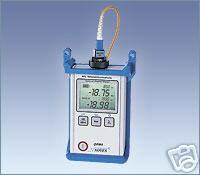 An easy to read Dual Wavelength LCD display with Backlight shows measured power [dBm or ?W] or insertion loss [dB], calibrated wavelengths, tone signal [Hz], wavelength ID, and the battery charge status. Up to 500 records per wavelength of power or insertion loss measurements may be stored in internal non-volatile memory.